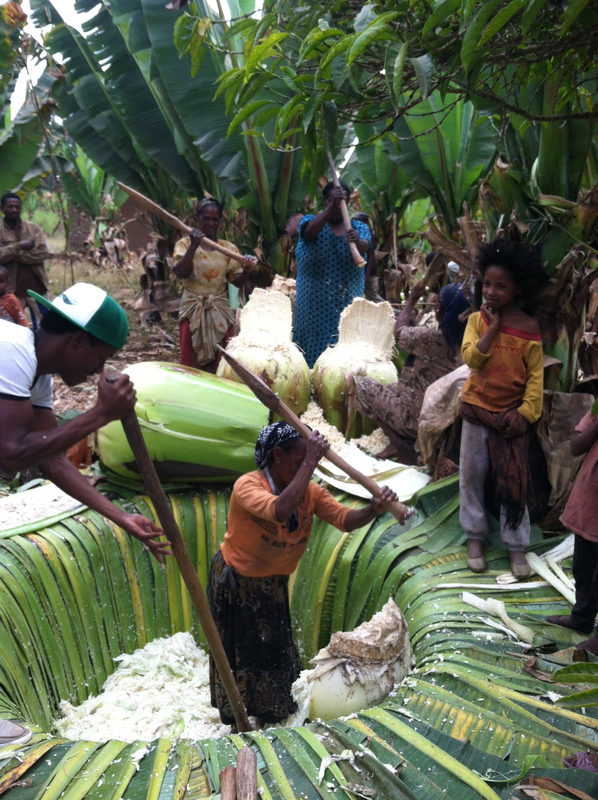 The Abeza family processing Ensett (false banana) a staple and highly productive chorm that Ethiopians use to make “kocho.” See Mohammed in the GreenPath hat? So, dear friends, I know it has been a while. 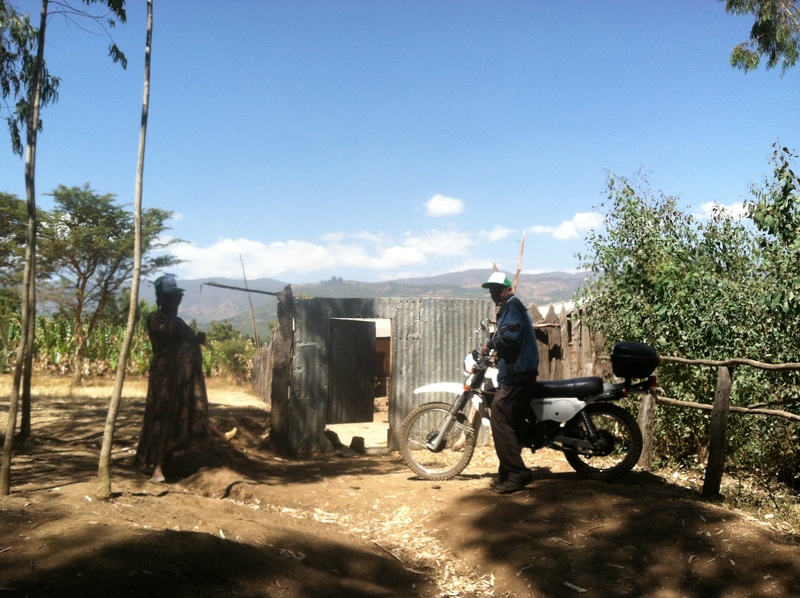 I want you to know that, despite the fact that I have posted very little on the permaculture4peace.org website or facebook, that I am having an exciting, life-changing experience working with GreenPath Food in Ethiopia. The farmers are so excited about what we are doing. They’ve never met an entity like us- We’re not a charity, we’re not the government, and we’re not an exploitative corporation. We made our first harvest last Friday- our partner farmer’s first profit off of avocados! They had never gotten so much money for this “monkey food” before. The local markets are flooded with all the same products- we’re creating a supply chain that gives them access to markets that will pay fair money for organic avocados, as well as hopefully other crops in the future. My biggest challenge? Getting information and materials. A lot of my job involves keeping my eye out for seeds/cuttings so I can collect them and propagate them out of our nursery at the Ethiopian Horticulture Center for Excellence. There is not a lot of crop diversity here, and farming practices are very destructive of the soil. I’m initiating restoration agriculture, but without access to cover crop seeds. When you go to the local seed union, the list of seeds is a half a page long, while the list of chemicals is 3 pages long (No exaggeration!) Also, there is little to no internet (I’m lucky if I get 2G on a good day.) Google is futile. But I find that all I need to do is walk outside with my eyes open, draw plans in my notebook, and solutions present themselves from the permaculture muse. My latest hacks? Creating rooting hormone with aspirin and water, planning a freshwater kelp harvest from a local lake to deal with Boron deficiency, and creating harvest bags out of used concrete bags. Furrow irrigation and ploughing are a common practice. 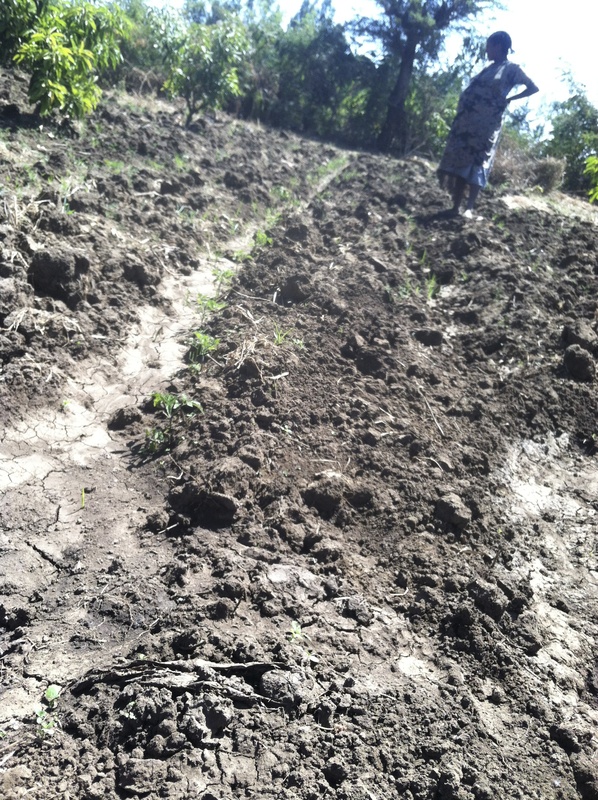 This has long-term consequences of eroding and salinating the soil. Our goal is to integrate cover crops that rebuild the soil structure. This “restoration agriculture” approach goes against convention here (just as it would in the US), and for now we are focusing slow, simple solutions. Oh- and you can see two 2-year old Fuerte avocado trees growing in the upper left! I am in constant creative problem-solving mode, and loving it. I feel like I’m “Growing my hands.” That, even if I’m not a master permaculturist yet, by the end of my time here, I will be. I’m creating designs for 17 different farms- long term visioning but also day-to-day problem solving. Everything about this job is exciting and meaningful, on every level. I am working with an incredible team of brilliant, compassionate people from all over the world. Sidhanth Kamath, our General Manager, is an incredible visionary, and one of the smartest, most capable people I have ever met. Ezra Nigussie, our operations manager, is the most solid team-mate I’ve ever worked with- always on the ball, honest, positive, and on top of things. I don’t know when he sleeps : ) Amerga Menji is our horticulture specialist, and is an expert on avocados. His experience and good sense of humor fill my farm visits with joy, and we are learning a lot from each other. 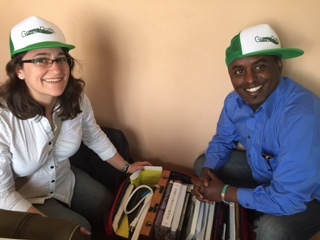 Eden Getachew is my woman in Addis- she works for the Tony Blaire foundation now, and was integral in establishing GreenPath. She used to hold my job, and I have very big, classy shoes to fill. Eric Couper is a Technology Wiz, a voice from across the ocean that makes magic happen in digital space. Mirafe Marcos provides us with visionary guidance from the Agricultural Transformation Agency, and I like to call his Mom is the “Patron Saint” of GreenPath. She is an entrepreneur herself and has pulled many administrative strings to help us. And of course, I’d be remiss if I didn’t mention Mohammed, the 21-year old Butajira-native who is learning English as he assists me with all kinds of odds and ends. He holds the other end of the tape measure, and takes me to the clinic when I’m sick : ) I think great things are in store for him as he grows with our company. CZ & Ezra with the notorious red suitcase of books. Without regular internet, I am grateful for every single one of these reference materials! Overall, I am honored and grateful to work with such an amazing team on such an important venture. I could never have imagined being part of something so incredible, but now that I’m here, I feel like I am exactly in the place I need to be at this stage in my life. The level of professional and personal growth I am experiencing right now cannot be expressed in words. I am honored and excited to take on the challenges before me. 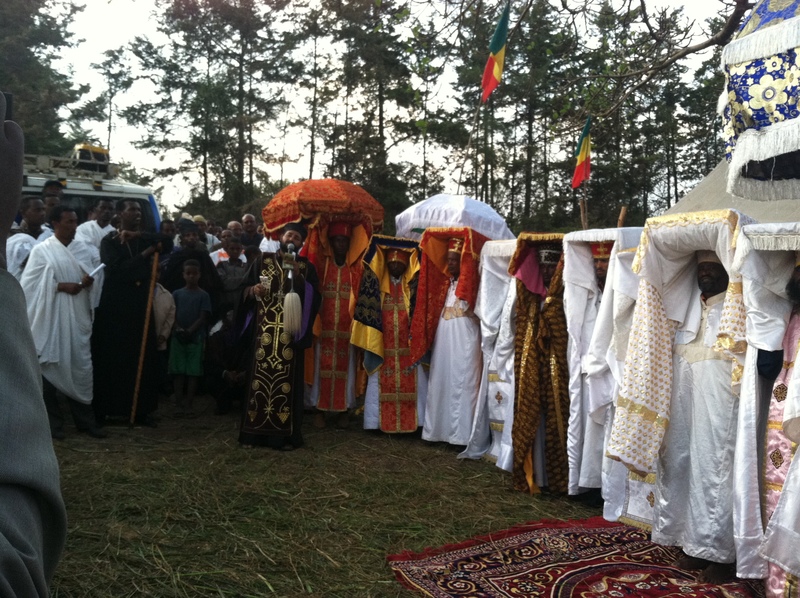 Ethiopian epiphany celebration! So very Beautiful! People marched sang, and drummed in the streets, as they rolled out a red carpet before priests in brilliant robes carried icons under gold-embroidered umbrellas. Ethiopia is at once an ancient and cosmopolitan mix of religions, languages, and cultures. It’s the most fascinating place I’ve ever visited. I’d recommend it to anybody to come and visit! Amazing! Knowing you from an entirely different sphere (music) and knowing nothing of permaculture, every paragraph has ne going “wow!” and using that google we take for granted to learn more. Thank you so much for this upload. An inspiring read as I begin my interactions with a well established permaculture organization in East Africa. It amazes me how ineffective and damaging traditional and missionary aid programs have been in these areas. I look forward to your next update. Bless you. Thanks for reading about our work, Kyle. What kind of work are you doing? Where are you in East Africa? I’m new in the area also, so we probably have a lot to learn from each other. I’m working with these guys. I am helping with the Ethiopia portion. Don’t have time for in depth response right now. But would love to discuss more in the future.